Imagine trying to study for a test, not only at a regular school, but one for wizards, and also fearing that a monster will petrify you. That’s how Harry Potter feels. The Chamber of Secrets is open, muggle wizards are being petrified, and there’s a mysterious person who might know something about this. Also, could Harry be the descendant of Slytherin? 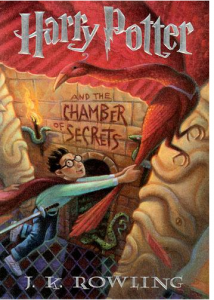 All these thoughts and more are appearing in your mind as you read Harry Potter and the Chamber of Secrets. Harry Potter is a wizard along with his best friend Ron and Hermione. All go to a school called Hogwarts school of Witchcraft and Wizardry. Ron is a very fired up person, and even though he is learning magic he isn’t afraid to use his fists. Hermione who is sometimes bossy, but mostly light hearted, is intensely interested in being a witch. All throughout the story every character is very engrossing and helps gets the reader sucked in, believing that they are in their world. There is conflict between characters like Harry to Draco. Also, there are problems that Harry has to solve himself, like ability to speak and hear parseltongue. It amplifies the hatred some people have to people like the snobby Draco Malfoy. It also touches up upon the pity and sorrow some people feel for people like Hagrid who was expelled, but is now their gameskeeper. Also the air-headed behavior of characters like Gilderoy Lockhart can be annoying, but also they can play into the plot. Even though I’m praising almost everything in it, I also found some parts that weren’t as good. It was that some characters didn’t have the time they needed to be established as a major character. Take for instance Ginny. I was surprised that she doesn’t really get that much time in the book, and that disappoints me. Ginny could’ve been in some of the other parts, but the only part besides the beginning she’s in is on Valentine’s day and at the end. If they included her own point of view, it would have been stronger. For example Harry’s point of view and what he’s doing is used a lot. Since she was only in some parts, I couldn’t see much character development for her. Even with these flaws this book is a type that anyone can get into whether old or young, into fantasy or not. 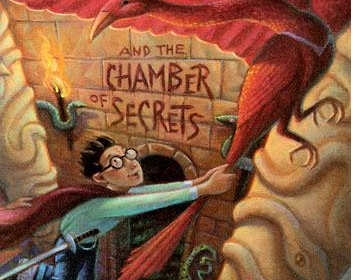 The magic of Rowlings’ Harry Potter and the Chamber of Secrets marveled me with all it brought to the table. If you can find a copy, I highly recommend you read it. I promise it won’t disappoint.